Mum’s best friend, freezer biscuit dough. School holidays have finished and the Ankle Biters have returned to their term time routines. One thing I have noticed about school holidays is that they could easily become very expensive propositions. Not in this house. I’m not wired that way. Poor Ankle Biters. Instead, we have movie days at home with popcorn and biscuits. Or inside picnics with friends (it’s been too cold for outdoor picnics), with fresh bread, sausages, home made sauce, fruit platters and biscuits. We’ve visited friends and taken a nice plate of biscuits with us. We’ve been on long walks along the creek and taken some biscuits for mid-wander nibbles. Are you sensing a theme here? Yes, now that I have mourned the tragic death of my freezer and replaced it with a more energy efficient working model, I once more have the capacity to freeze to my heart’s content. Something that I love to have ample supplies of in the freezer is biscuit dough. There is so much variety possible, it’s quick to stock the freezer and even quicker to impress Ankle Biters and guests with delicious freshly baked biscuits. You have total control over ingredients and their quality and it’s a very budget friendly way to provide a treat. I should clarify at this point. I am talking about cookies. Not scones. Confused? Don’t be. 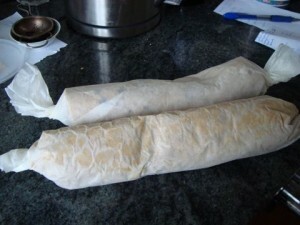 No matter which dough I make, it gets spread into a log shape on a piece of baking paper, roughly 20cm x 10cm, rolled up and the ends twisted. Then it goes into the freezer. When it’s baking time, I take out a log of dough, leave for about 10 minutes and then slice into biscuits 5 – 10mm thick, depending on my mood. 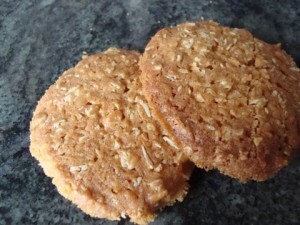 They are baked in a moderate oven for 10 – 15 minutes. A reasonable guide is to take them out of the oven when the house smells unbearably good. Or for paler dough, when the biscuits have browned a little. It is harder to tell visually with dark dough when it is cooked but texture is a good indication. Experiment with a paler dough first so you can tell the difference bewteen the uncooked and cooked textures. As with all baking, it is best to have all your ingredients at room temperature before begin. Then the basic biscuit dough making method is to begin by creaming together your butter and sugar (muscovado in my kitchen), then mix in the egg, then the flour and then any remaining ingredients. As I spend most of my life in a tearing rush, I tend to bung the butter, muscovado, egg and flour into the thermomix, combine it all on about speed 6 and then mix the rest through either manually or on reverse speed 1 or 2 depending on the ingredients. This is a good base that can be fiddled with in any way you so desire, add fruit, nuts, chocolate, vanilla, lemon zest. Go crazy, use your imagination! 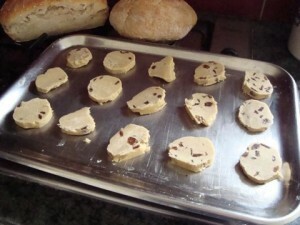 Pictured is a batch of foundation dough, with sultanas, sliced and ready to bake. 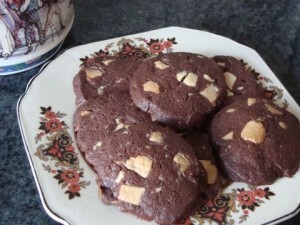 And for something more decadent, Double Chocolate. I’m a fan of a cocoa biscuit with white chocolate chunks. All fair trade of course. With a few different rolls in the freezer, it’s easy to slice off a few bscuits from each roll and quickly bake a mixed plate. Perfect for the Anle Biters to fight over! It sure is Maria! Seems to get crazier all the time. Apricot, chocolate and coconut sounds divine. I can get muscovado at my usual independent supermarket but I don’t think the evil two stock it. I love the idea of these Dani. Freezing the mixture also solves my problem of having a small oven and normally having to cook biscuits in two lots. Do you use dark or light muscovado sugar in these? I’m trying to get my head around these sugars (and rapadura). Hi Chelsea. There’s lots of advantages to being able to bake a small batch at a time. If I bake too many I just eat them all! I use dark or light muscovado or rapadura. They all work. My preference is usually light muscovado or rapadura as they blend a little more easily than the dark muscovado. Absolutely Renee. I just prefer not to used processed sugar. I shop at an independent supermarket which has muscovado readily available. I doubt you old find it at the big two though. Organic shops would be able to help you. Ohmy, this looks nice! I’ll have to give this a try and see what my daughter likes.